Over 4000 whales per year come to the Samana Bay in the Dominican Republic. Until now, it was impossible to see those whales from your resort in Punta Cana. 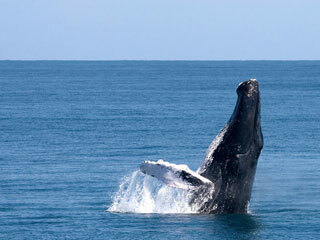 However, now we are able to offer our Whale Watching Excursions to guests of Punta Cana and the surrounding area. This is a once in a lifetime opportunity that you cannot miss! Don't miss this unique opportunity to observe humpback whales in their natural calving and mating grounds here in Samana Bay. Thousands of humpbacks visit the bay annually, and as many as 300 are present at any given time during mating season. 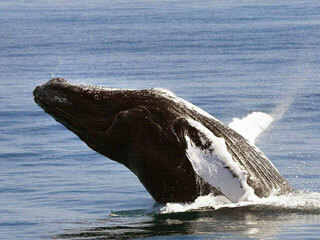 Samana Bay is one of the best places in the world to watch whales. A truly unforgettable experience. Whale watching has become an increasingly popular worldwide activity, and the Dominican Republic is fortunate to have one of the largest and best humpback breeding sanctuaries in the world. Fly in our private plane to Samana to observe these magnificent creatures. Afterwards, continue to Cayo Levantado, a small island in the middle of the ocean. An experience of a lifetime, not to be missed!